Julian Assange of WikiLeaks and his lawyers have been asking the Swedish prosecutors to question Assange over sexual misconduct allegations in London, where he is in exile at the Ecuadorian Embassy. He’s been there for 1,000 days now. The alleged incident took place in 2010. He fears if he goes to Sweden to face the allegations and questioning, he may be extradited to the United States to face espionage charges and more for the WikiLeaks releases. After aggressive effort on the part of his lawyers, the Swedish Supreme Court finally asked the Swedish prosecutor about the delays. As a result, the Swedish prosecutor has now agreed to question Assange at the Ecuadorian Embassy in London. Now joining me to discuss all of this is Michael Ratner. Michael is the president emeritus of the Center for Constitutional Rights in New York. He’s one of the U.S. attorneys for Julian Assange and WikiLeaks. Ratner is also the chairperson of the European Center for Constitutional and Human Rights. Michael, as always, thank you so much for joining us. MICHAEL RATNER, PRESIDENT EMERITUS, CENTER FOR CONSTITUTIONAL RIGHTS: Thank you for having me on The Real News. PERIES: So, Michael, clearly the Swedish prosecutor is now under the gun, has been questioned by [Sweden’s] own Supreme Court about why the case has not been advanced. How did all this happen? RATNER: Well, this is a real victory for Julian Assange. I mean, for over four years he’s been trying to get questioned about these allegations. The prosecutor has refused to do so, despite the fact that he’s in an embassy, can be questioned, and is open to it. And as she said, initially it’s not legal for her to question him at the embassy. So all of a sudden a few days ago she says, I’m going to question Julian Assange, and she gives the excuse that the statute of limitations is running–and it is running on three of the four allegations against him. But it was running a couple of months ago. It’s been running forever. So why this change of mind, as you put it? In fact, Julian Assange’s Swedish lawyers have been making vigorous efforts in the courts to say, you can’t keep someone detained in an embassy like that under a warrant of arrest for questioning and then not question him. The Swedish procedure requires that the case move forward. And they’ve received very little success in the courts. From the middle court they got a statement that the prosecutor was not doing her duty. And then, finally, we go to the Supreme Court, the highest court in Sweden. And while they haven’t yet accepted the case, they did say in response to the Swedish lawyer’s papers, they said to the prosecutor, tell us what is happening and why this is happening in this investigation. And the prosecutor obviously got the message. She was going to be in trouble in the Swedish court because Swedish law is not being complied with. This is the longest pretrial detention and Swedish history. And make no doubt about it: Julian Assange is detained in the Embassy, because if he leaves that Embassy, he got sent to Sweden, and hopefully to the United States, and therefore it’s not a voluntary action by Julian; it’s a choice between asserting his right to asylum or giving it up and winding up in the United States. So all of a sudden, because of that court ruling, the prosecutor says, oh, now, four years later, I’ll question Julian Assange. And, of course, there’s been deleterious effects on him because of a failure to question him earlier. One is the allegation is still outstanding, which I think if he’s questioned, they may not be there any longer, the case may be dismissed. In addition, Julian’s had to give up his passport, contact with his family, been confined to an embassy in conditions that we have now claimed in both the UN and will ultimately claim in the European Court of Human Rights are inhuman treatment. He doesn’t get even the one hour of exercise outside a day that the UN minimum standards for imprisonment require. PERIES: So, Michael, why is this unfair to the women involved in this case? RATNER: Well, what happened here is Julian Assange has been willing to answer questions about the allegations in the complaint that’s in Sweden since the beginning. Unfortunately, the prosecutor has sat on her hands and not moved the investigation forward. She’s had over four years to question Julian Assange. He’s been open and willing. He’s been at the embassy. There’s treaties of mutual legal assistance. You can do it. And so [incompr.] has denied due process to the women is the failure of the Swedish prosecutor to actually carry forward the questioning of Julian Assange. And, of course, it makes you very suspicious. What’s really going on here? Is the prosecutor really interested in protecting the rights of the women? Or is she doing something else here to keep Julian Assange in limbo in an embassy, and with sexual allegations out there that have not, because of her own fault, the prosecutor’s own fault, been answered. PERIES: Right. And then one of the issues at heart here is that if Julian Assange goes back to Sweden, he could easily be extradited to the United States. So let’s get into that. Why would that happen? And what are the issues with that? RATNER: You know, the extradition to the United States and ultimate trial in the United States is the big elephant in the room. [incompr.] Sweden has been important out there, but of course there’s been a failure to question. And now Julian has been in the Embassy–today, as I speak to you, is the thousandth day in the embassy, and he’s had over four years of being in some form of custody because of Sweden. Now, if he went back to Sweden and if they charge him and not just held allegations, if they charge him, and if they try him, and if he’s convicted, and if he gets some the maximum sentence he could ever get in Sweden, he will get credit, I’m 99 percent sure, for the time he’s put in already in custody, particularly in the embassy and beyond. And so he will basically be out the day he’s convicted based on time served if he were to be convicted, which I think is very low likelihood, but he would be time served. So Sweden is not Julian Assange’s problem. The problem, as I said, is United States. The United States has had a five-year investigation of Julian Assange, WikiLeaks, and people who work for WikiLeaks. You know, when people initially said, oh, no, he’s just hiding from Sweden, the U.S. isn’t really after him, after all, he’s a publisher and not a whistleblower, well, let me just say, I went to the Chelsea Manning trial. Chelsea Manning is the one who allegedly gave the Iraq and Afghan war logs to WikiLeaks, “Collateral Murder” video. Manning is serving 35 years in prison for that. At that trial, the prosecutor went out of their way to try and say Julian Assange and WikiLeaks were in a conspiracy with Chelsea Manning. They obviously didn’t succeed at that trial. But since that time, and only recently, two events have happened that again indicate to me the U.S. is really after Julian Assange and WikiLeaks. The first is a series of search warrants were finally disclosed to us by Google a couple of years after the fact, because they had a gag order. These search warrants were for all of the Google emails of Sarah Harrison, Kristin Hrafnsson, and Joseph Farrell, three employees of WikiLeaks, for a period of many years. And those were all turned over to the federal government. And we just got notice of that. So we know there’s an investigation, serious investigation, of WikiLeaks and its employees. The second thing, actually, a court decision that’s had to do with a Freedom of Information Act case, and the court denied documents to the requester in the Freedom of Information Act case because there is a continuing–as the court said–continuing multisubject investigation going on of WikiLeaks, and it’s not to do with the Manning trial. And it actually stated the crimes for which WikiLeaks is being investigated: espionage, conspiracy to commit espionage, theft of government documents, Computer Fraud and Abuse Act, and then a conspiracy [incompr.] all those. So, as you see, there’s a serious, multilayered, multisubject investigation going on of Julian Assange and WikiLeaks. So if he goes to Sweden, whatever happens with that case, it is very likely, I would say almost a surety, that he will be extradited from Sweden to the United States. I say it in an interesting way, because it may be that, as some of said, he won’t be extradited for espionage, because many, many court systems consider that to be a political crime, not subject to extradition. But that is exactly why, as I just said, the United States sticks in charges like theft of documents, Computer Fraud and Abuse Act, conspiracy, because they want to try and avoid the political exception to extradition. And Sweden has a terrible, terrible record vis-à-vis the United States and extradition. It’s most infamous case was when the CIA recommended two people resident in Sweden be extradited to Egypt–Egypt, no less–after 9/11. And, of course, what happened to them in Egypt: they were tortured. Sweden’s record on protecting asylees who were seeking asylum into Sweden is terrible. And, of course, as everyone knows, it cooperates hand-in-glove with United States on everything from surveillance to weapons sales, to everything else. So it’s not going to be a good time for Julian in Sweden, in particular because of the extradition. Now, Julian has said, his lawyers have said, Julian can go to Sweden, deal with the Swedish case, if he got a guarantee from Sweden that he would not–that Sweden would not forward him to the United States on extradition. Sweden, again claiming, oh, we can’t do that legally, is just lying. Extradition in Sweden, like in every other country, is ultimately determined by the executive. Sweden could tomorrow say if Julian comes here for trial, assuming there’s charges ever laid against him, if Julian comes here for trial, we will guarantee not to extradite him to the United States. They won’t. So Sweden is playing an utterly duplicitous role here. PERIES: Now, one final question to you, Michael. If Julian Assange is questioned and they derive from the questioning that no charges needs to be laid and the case does not go forward, what happens to him next? RATNER: Well, then he shouldn’t–obviously, he won’t be extradited to Sweden. The question is what happens when he then walks out of the embassy. And this is a very important point. 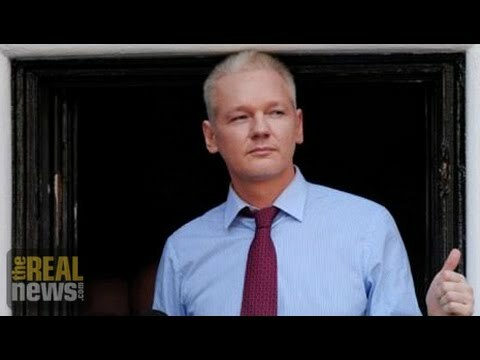 Let’s all of us remember Julian Assange has asylum from the country of Ecuador. And it was given to him because of the prospect of facing persecution in the United States and facing onward extradition from Sweden to the United States. That asylum has not been recognized by the U.K. or by Sweden. They have a legal obligation to recognize it. So it gets to the your question: if he walks out of that Embassy, he should be able to walk into a taxi, take it to Heathrow, and get on a plane to Ecuador. He should be up to do that. But so far the British have said they will arrest him for violating the conditions of his bail–let’s remember, conditions that were imposed because of what occurred in Sweden. In that case, he’s taken into U.K. custody, and that case is the U.S. then launch their extradition from the U.K., which is certainly conceivable. But hopefully, if the Swedish case can be dealt with, that the British will see that they have to recognize the asylum and not arrest Julian Assange when he walks out of that Embassy. I want to close by saying this is all this legal framework, two other things are happening here. We’re looking at taking this case to the European Court of human rights in Strasbourg on the grounds of arbitrary detention, as well as inhuman conditions in the embassy, because he’s not allowed out for an hour of exercise, he’s not allowed to go out to a doctor in an emergency, etc., and he’s arbitrarily detained, obviously. But in addition I should say–and I want to end on this–is right now as we speak, there’s eight and a half million documents up on the WikiLeaks website–highly searchable. The majority of those documents have been put up on that website since Julian Assange has been in that Embassy. And I’m saying that to indicate that, yes, these legal cases are all very important, and for all of us lawyers working on it for Julian. But what’s really critical here is that WikiLeaks has continued to function as an ongoing, important organizations for revealing really–really revealing depredations and illegalities of governments around the world. PERIES: Michael, thank you so much for joining us today.